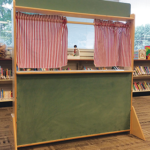 We now have a puppet theater in the Children’s Area to encourage creative play, which is a building block of early literacy. We will rotate the puppets available to use periodically. Enjoy!